Sometimes, you may want to pay special attention to specific contacts on your Mailchimp audience. To do this, mark important contacts as VIPs so you can use segmenting conditions to send targeted campaigns. In this article, you'll learn how to designate contacts as VIPs and how to create segments to send targeted campaigns to VIP contacts. 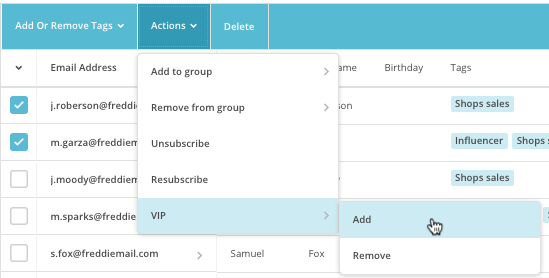 You can designate up to 5,000 contacts as VIPs across all audiences in a Mailchimp account, based on any criteria you choose. A contact's VIP status is specific to each audience, meaning if someone is in two Mailchimp audiences, their VIP designation in one audience does not automatically make them a VIP in the other. To designate contacts as VIPs, follow these steps. Check the boxes next to the contacts you want to designate as VIPs. Click the Actions drop-down menu and choose VIP. Choose Add to mark the subscribers VIPs. Click the Confirm button in the pop-up modal to confirm the VIP status. VIPs display a VIP icon next to their Contact Rating. You can also designate individual contacts as VIPs on their profile. From their profile, click the Actions drop-down menu next to their portrait, and choose Add VIP. To remove VIP status from contacts in bulk, follow the same steps, but choose Remove instead of Add. You can use segments to send targeted campaigns to VIP contacts. To create a segment for your VIP contacts, follow these steps. Set the drop-down menus to VIPs | is member of. Type a name for your segment in the pop-up modal, and click Save. After you save your segment, you're ready to send to your VIP contacts. You can choose to send a campaign to your segment when you view it, or you can choose your segment in the To section of the Campaign Builder. For a step-by-step guide on how to send an email campaign to a saved segment, read Send to a Segment. The foundation of great marketing is up-to-date information about the contacts in your audience. Get tips on creating and managing audiences in Mailchimp.